Rava ladoo is a traditional dessert recipe made with sooji all across India which is usually made during festivals and various occasions. It is shared along with a video procedure and along with the detailed step by step written procedure. 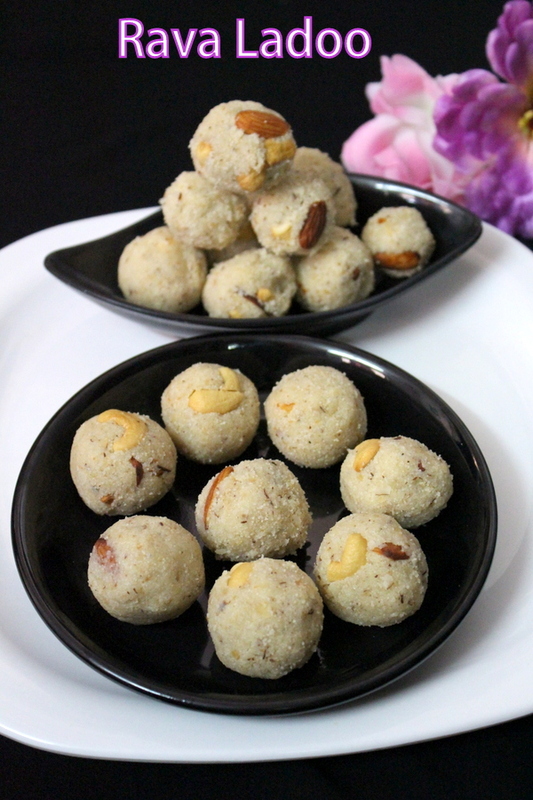 Rava ladoo is also spelled as rava laddu or it can also be termed as sooji ladoo. In this recipe I have added fresh grated coconut but instead of fresh coconut, desiccated coconut too can be added. It is made using semolina/rava/sooji in ghee and sugar. Rava ladoo are small round sweet balls made using sooji, ghee and sugar. This sweet recipe can be made very quickly and instantly and it does not need many ingredients to make. Rava is the main ingredient to make this sweet recipe and this is a special festival recipe. It is very popular in south india and it requires good amount of ghee/clarified butter to get a perfect outcome. Sooji is such a wonderful ingredient with which we can make various recipes which are instant and quick to make. I would like to make many instant recipes on my blog and would love to share with everyone some of the quick recipes that are good for breakfast and snacks and sooji helps in making some quick recipes. Sooji is used to make deep fried recipes, sweet recipes, breakfast recipes which can be prepared in couple of minutes. 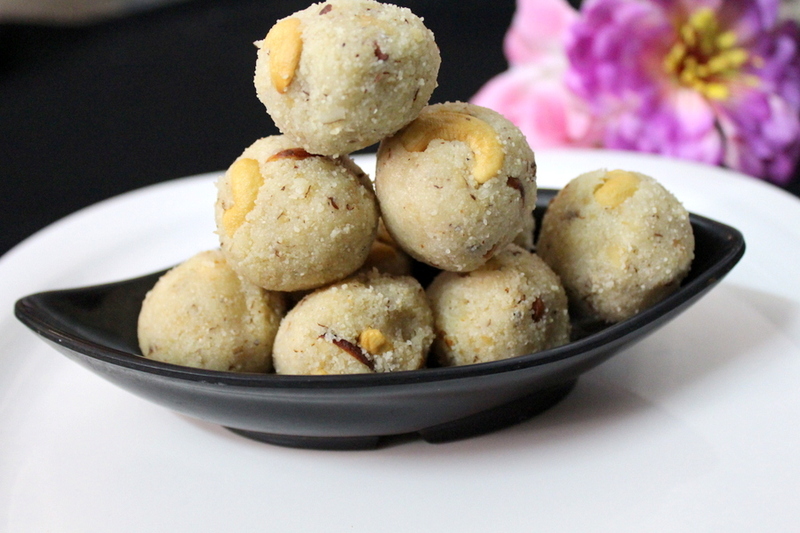 Here I have made sooji rava ladoo without using khoya. I have used main ingredient as rava/sooji and to make the sweet, I have used ghee, powdered sugar and to give a wonderful fragrance, elaichi powder has been added. These rava ladoos can be stored for a couple of days in airtight containers. If stored in airtight containers, the ladoos can last for few days. 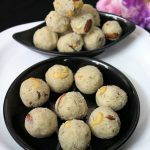 Below are the recipe details to make this simple rava ladoo along with a video procedure and step by step details. 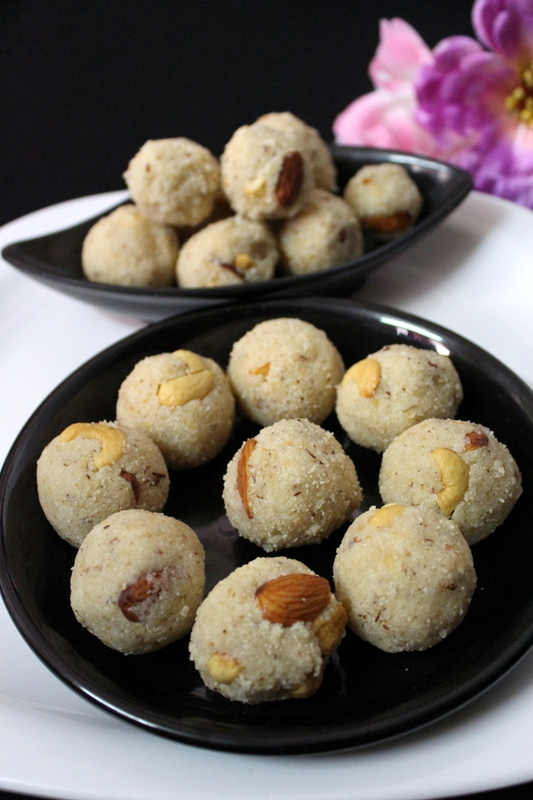 It is a festival sweet recipe made using sooji/rava in the form of sweet round balls giving them a laddu shape. In a pan, add ghee and heat it. Add chopped dry fruits like cashews and almonds until they turn slight golden color. Into it, add sooji/rava and roast it for about ten minutes on low flame. Keep stirring continuously until the color of sooji changes. Add fresh grated coconut, mix up well and saute for 2-3 minutes on low flame. Add powdered sugar, add elaichi powder/cardamom powder, mix well. Add milk, mix completely and switch off the flame. Cool the sweet down for about 10-15 minutes. Once it cools down, take small portions of the mixture in your hands, make round balls in the shape of a laddu. Similarly, make laddus of the remaining sweet mixture. Serve them or store them in airtight containers for later use. 1.Roasting of sooji is very important to make aromatic rava ladoo. 2.Cooling the mixture is necessary as we can't take the mixture in our hands when the sweet mixture is hot. Cool the mixture and make laddus. 3.One can even replace fresh coconut with desiccated coconut or we can also make rava ladoo without coconut.